Pink gin is also known as gin and bitters and it is, quite simply, those two ingredients. Specifically, it uses Angostura Bitters, which gives the entire drink a slight pink hue. It is a fabulous aperitif to enjoy with dinner and a great way to show off your favorite bottles of gin. 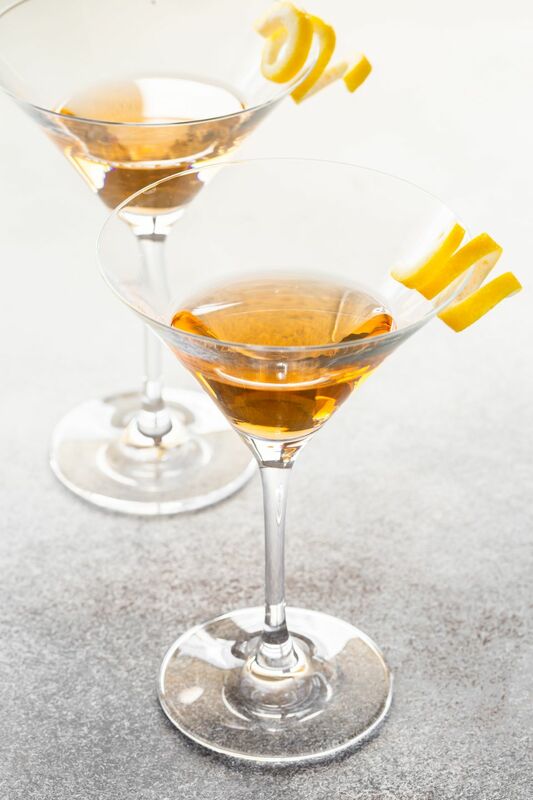 This classic cocktail was originally created for use by the Royal Navy. In the 1800s, it was common to give sailors bitters as a medicinal treatment. By mixing it with gin, it was more palatable and the gin would have certainly added to its appeal. You may also hear the name "gin pahit" in 19th century sailing stories like those by W. Somerset Maugham. This is the essentially the same drink, the name has simply been lost to time. The word "pahit" is Malay for "bitters." Plymouth Gin claims that there is a more traditional way to mix up a pink gin and it is a bit more involved than simply stirring gin with bitters. Of course, they recommend their own gin, specifically Plymouth Navy Strength Gin, and it is a very fine choice indeed. "Navy strength" gins are higher proof than the average gin and Plymouth's version weighs in at 57 percent alcohol by volume (ABV, 114 proof). The point of this pink gin is to get the alcohol to feel "pleasant not aggressive" and Plymouth recommends tasting it prior to straining it into the glass. It's a great strategy and proof that dilution is key to making cocktails spectacular. Water is necessary to cut the alcohol and make the drink pleasant, particularly with those full-flavored, overproof gins. Try the pink gin both ways so you can see the difference for yourself. Express the oils of a lemon peel over the drink and drop the peel in if you like. Add 1 dash of Angostura Bitters to a mixing glass filled with ice. Swirl this bittered ice and water around in a cocktail glass. Dump out the water, leaving the glass with a bitters rinse. Back in your mixing glass, pour a "large measure" of gin (2 ounces is good) and fill it with ice. You can choose any gin you like for a pink gin, though you may enjoy this cocktail more with one of the sweeter or lighter profiled gins. Remember that the recipe adds nothing besides bitters and water, so whichever gin you choose, it should definitely be your best. Plymouth Gin: A fruitier profile with a full body, Plymouth Gin is a perfect candidate for the pink gin. Hayman's Old Tom Gin: Old Tom gins bridge the gap between sweet genever and the famous London dry gins. Hayman's is one of the best brands of this small class of old-school gin. Tanqueray Malacca: It makes a rare appearance on the market, but this sweetened version of the famous London dry is perfect for a pink gin. When you see it, mix it! Nolet's Silver Dry Gin: Soft florals and fruits are the hallmarks of this gin and it shine with the gentle treatment of a pink gin. Right Gin: A Swedish gin that also has a sweeter flavor, you'll love the rosiness of this one in such a simple cocktail. Aviation Gin: One of the first New Western Dry Gins to get us thinking about a softer side of gin, Aviation is readily available and ideal for drinks like this. You can also use the pink gin as a sort of litmus test for trying out new gin brands. It's even a slightly better option than the classic martini because it is so clean and allows the gin to shine virtually unadulterated. For example, you might use it to familiarize yourself with craft gin brands like William Elegant 48 or Bloom Gin, or to compare the contrast of Leopold's two spectacular offerings. How Strong Is the Pink Gin? The pink gin will be slightly weaker than the bottling strength of the gin you pour. This is because it is diluted with water alone and your approach to mixing will play a great role. Instead of estimating the strength of the drink, let's look at how the dilution will affect your pink gin. If you stir your pink gin with an 80-proof gin using the typical 1/2-ounce allowance for dilution, the drink will be about 32 percent ABV (64 proof). If you use Plymouth's suggested method, an entire ounce of water may be added to the drink. In this case, an 80-proof gin would weigh in around 27 percent ABV (54 proof). If you stir according to Plymouth and use their Navy Strength gin, it is the strongest of them all at about 38 percent ABV (76 proof). The strength of the pink gin and similar cocktails is precisely why they are served in such small proportions. Notice that neither method tops a 3-ounce drink, even with water. These are meant to be casual drinks that are enjoyed slowly.